Languages: English, French, German, Spanish, Japanese, Korean. Game type: Mobile (iOS, Android), browser (Facebook). Timeframe: 2014 to present time. Team: 15 people, including 1 project manager, 7 translators, and 7 editors. BreakingLands is a strategy game for players age 7+. Players find themselves on a deserted island. They must explore new land as well as fight for resources and learn to make profit under unfamiliar circumstances. This game is notable for its colorful graphics and humorous plot elements. 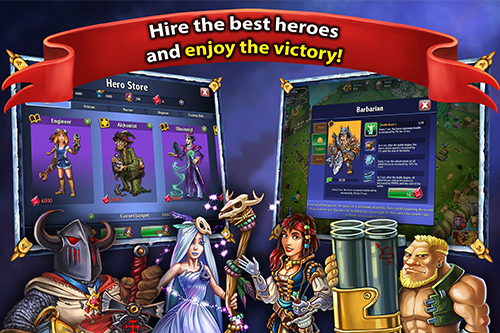 The humor practically makes it a parody of “serious” strategy games. The game allows players to ally with friends and use an in-game chat. Localization work for this application was done in two stages. First, the text was translated from Russian to English. Then it was translated into the other languages. Because the game’s age rating is 7+, special attention was paid to the translation of the terms and grammar constructions. This ensured that it remained age appropriate. Also, the translators played the game to preserve its feel. This helped them to successfully translate jokes and allusions. A detailed glossary was compiled to assure terminology consistency. Two-stage localization: Russian to English, then into other languages. The need to preserve humor in the game. From its founding moment in 2011, the UFS Games team has always aspired to create unique games able to attract players from all over the world. Now the company consists of more than 30 people, all of them total fans of what they do. The company mission is to make interesting and top-of-the-line games. All Correct Games is a division of All Correct Group which provides translation, voiceovers, localization testing and video game localization. All Correct Games works with the majority of Russian developers and publishers, along with major international game publishers. The company has participated in the localization of over 350 games, as well as the testing of over 100 games. All Correct Games works in more than 23 language pairs, partners with 6 voice studios, and employs highly competent native and Russian speakers to test games on the iOS, Android, and PC platforms.